Winston “Buddy” Walters attended college in Mississippi on a full football scholarship, graduating in 1980 with a degree in Business Administration. After working for nearly a decade in the business world in Houston, Texas, Buddy sensed God leading him to Dallas Theological Seminary, where he earned a Masters in Theology and met his future ministry partner, Doug Humphrey. Together the two pastors launched Triangle Community Church, laboring together for the next ten years to build a community of growing believers. 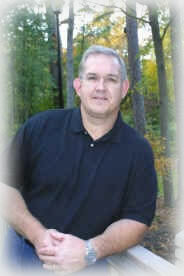 Buddy, a man of prayer and compassion, was best known for his vibrant leadership of the worship team. On Sept 11, 2003, Buddy unexpectedly went home to be with the Lord. Before his death, Buddy had been pursuing his other passion, theology, by formulating plans for a library of quality books accessible to the TCC family. The Buddy Walters Memorial Library is now located in the Second Modular. Buddy is survived by his wife, Debbie and two sons, Winston and Andrew.